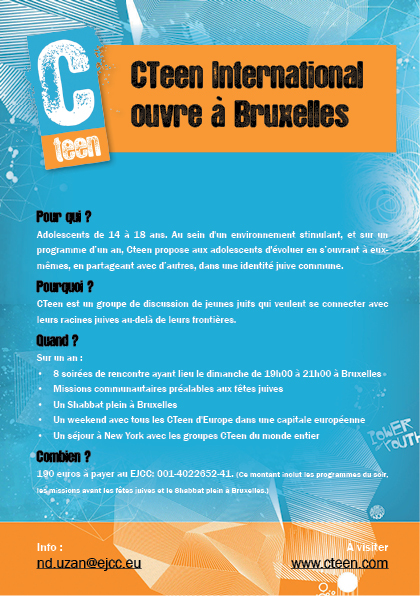 NEW CTeen Kickoff in Brussels! Cteen is an international program for teenagers between 14 and 18 years old which provides a nurturing environment where teens can learn about themselves through giving to others, identify with individuals who share the same faith, and be part of a group that focuses on building positive core values. Cteen international was designed 10 years ago with the aim of opening our teens to meet other Jewish teens from other countries by creating a network of Jewish teens worldwide. It is not a youth movement, but rather a Jewish teen discussion group who wants to connect with their own Jewish roots while seeing beyond their national boundaries. This programme consists of 8 gatherings on Sunday evening from 19:00 to 21:00, community missions before the Jewish holidays, 1 Shabbaton in Brussels, one week end gathering all CTeen Europe in one of the European capital, and one trip to NY, gathering all the CTeen worldwide during the winter break in February. The cost of the program is 190 euro to be paid at EJCC : BE10 3631 6154 0204 . This includes the evening programmes, the Jewish holiday missions and the Brussels Shabbaton.